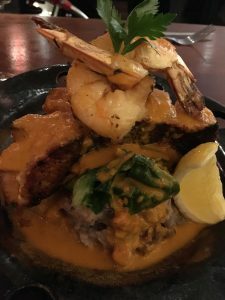 In Encinitas, but on just the East side of the I-5 freeway, San Diegans can step into the heart of Peru at the Q’ero Restaurant (pronounced Key-air-oh). Their website says “Q’ero” is a community that is said to be the guardians of ancient knowledge. To that end, the food and drink available proves it true. The bartender Michael served up a savvy collection of Piscos and South American wine. 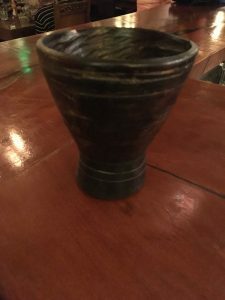 He trotted out the restaurant’s “qero” a drinking cup from the Inca culture of the Andes mountains in South America. And then he bestowed a passion flower cocktail with traditional Pisco as the base, a liquor distilled from grapes. 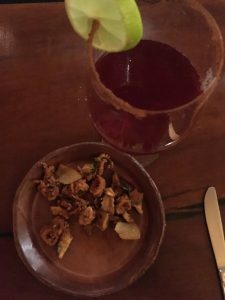 The appetizer of crispy calamari with shitake mushrooms, chili de arbol and cilantro, Calamari a la Diahlada, went well with the Pisco and a red blend wine from Mendoza called Siete Fincas. They offer a fried plantain-based appetizer dressed with a special house sauce called Aji Panca made from Peruvian chiles, citrus, vegetable oil and spices. The main dishes were meat and fish, but dressed in Peruvian finery. The grouper came with mashed potatoes, spinach and large shrimp: Pescado con salsa de Chupe de Camarones. On Michael’s recommendation, the pairing was a single vineyard dry Riesling from a German winemaker in Chile called Lafken that rode perfectly with the spice in the dish. 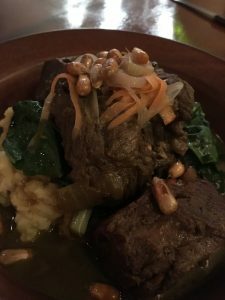 The red blend had the power to hang with the Costillasen Jora, beef short ribs in corn beer (Chicha de Jora) topped with house cured pickled vegetables and your choice of “kiwacha” (amaranth cake), mashed potatoes or sweet potatoe mash. If you’re still hungry – and you should come up with a way to be – try the Tres Leches. Best in San Diego.